Rahman Azer writes about Bengaluru’s Big Bull Temple in the 28 February 1976 edition of Swarajya. The 15-foot high, huge sitting bull carved in granite stone is one of the most important items of tourist interest in Bangalore. The bull, which is called Nandi or Basavanna by the devotees(Hindus) has its own legend behind it. 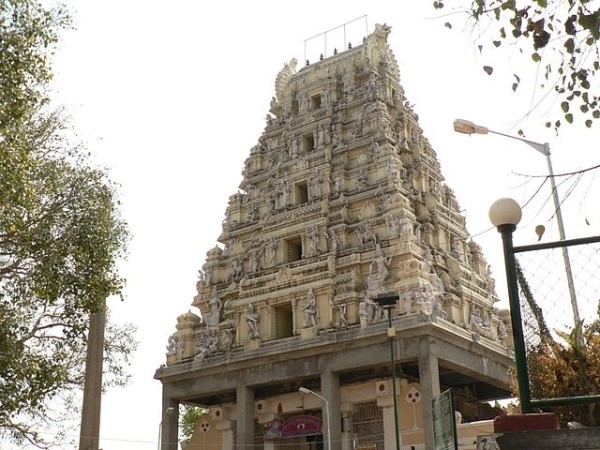 The story of the Bull Temple is closely connected with Kempe Gowda (1503-1567), the founder of Bangalore City. The two cannot be thought of in isolation. Kempe Gowda was a chieftain who ruled Bangalore, under the control of the Vijayanagar Empire. Nature worship has been very common in India since prehistoric period. Mr N.D.Mehta writes in his book, Facets of Hinduism, that “Indo-Aryans were children of Nature. They worshipped the Divine through its various manifestations in nature”. In this way, they worshipped animals too. Mr P.Thomas in Epics, Myths and Legends of India, puts forward the theory that “the great sages who us the Epics lived in intimate contact with animals and birds and for them they were not dumb creatures of blind instinct – but intelligent beings, more or less the kith and kin of humans. Hence, we find that in most of the Hindu scriptures, animals and birds occupy a place as important as humans. They are even deified.” In this way, the people started worshipping animals. The Hindus believe that the bull is Lord Shiva’s career. Legend has it that in the Court of Lord Shiva, in Kailasa, Ganesha was a drummer and Nandi, Basavanna or the bull, played on the “veena”. In the Bull Temple, we can see the huge bull in stone playing on the “veena”. The Veena is seen on a lotus. In short, the whole scene of Kailasa has been beautifully picturized in the temple. Nowhere else is such a huge monolithic bull to be seen in this particular pose, i.e. playing on the “veena” with its hoofs. The bull is facing the Cave Temple, the abode of Lord Shiva, which is hardly a mile away from the Bull Temple, Basavangudi. It shows that the people believe that at the end of Kaliyuga, it will walk to Lord Shiva because He rides on the bull. “Perhaps, the visitors to the Bull Temple would like to know something about the black colour of the bull. In fact, it was carved from one granite rock. Just to preserve the bull in, stone from decay, it is anointed with oil by the devotees. Above the head of the bull the ‘Trishula’ (Shiva’s trident) can be seen. This signifies that the bull has been associated with Lord Shiva. The Origin: There is a popular belief behind the origin of the bull. The Hindus believe that the bull was seen at the same place where it is sitting today. They also believe that hundreds of years ago, the bull was in flesh and blood. Every night the bull used to go to the nearby fields for grazing. In this way, it spoiled all the nearby groundnut fields. The poor farmers were shocked to see every morning their crops being spoiled by someone. One day, they all resolved to catch. The person responsible for the destruction of their groundnut crops. The whole night they kept watch over their fields hiding behind, the trees. In those days, the surrounding area of the present Bull Temple was a thick forest. At midnight they noticed a bull enjoying its fill. They caught the bull but said that they would perform ‘Pooja’ to it. They even told the bull that they would offer groundnuts regularly, on condition that it stopped destroying their fields. Further, all the farmers prayed to God to turn Nandi or Basavanna into stone. From that day onwards, the stony bull came to be worshipped by the people. Before this incident, that particular bull was not at all worshipped. To commemorate this incident, once in a year on the last Monday of Kartika, a groundnut fair is held around the Bull Temple. On that day, heaps of groundnuts can be, seen in the temple area. People who throng to the temple eat groundnuts with jaggery as much as they can. Since the bull, i.e. Basavanna, or Nandi was fond of groundnuts, they are showered on its body and garlands made from groundnuts are offered to the bull in stone. The above fair is called, “Kadalikayi Parishe”. This fair has been associated with the bull. People from far and near visit the temple and offer groundnuts to the bull, besides’ performing “pooja”. The bull is believed to have been gifted with divine powers. This fair turns into a special market of groundnuts. As stated earlier, the story of the Bull Temple is closely connected with Kempe Gowda. In fact, it was he who constructed the present structure nearly 400 years ago. Nandi was his family god. Kempe Gowda belonged to the Vokkaliga community. When he was a young boy, he was employed by a Brahmin for household work. He worked very hard for his master. Once he slept in daytime as he was very much tired. The master was astonished to see a cobra guarding the little boy, Kempe Gowda. The master said that one day Kempe Gowda would be a great king or ruler. History records that the Brahmin’s words came true. Kempe Gowda was a chieftain who founded the city of Bangalore. History records that once Kempe Gowda went to the nearby forest to take shelter. He passed the whole night there. When he got up in the morning, he was surprised to see a bull in stone beside him. He decided to build a fine structure around the bull as he thought that the bull only had saved him. Even today, two big stones and above them, two granite slabs can be seen as the border, marking the boundary of the city. In the days of Kempe Gowda, the boundaries of the city (Bangalore) did not go beyond Visweswarapuram and Basavangudi. In fact, at that time beyond Basavana Gudi or the Bull Temple, there were only forests. Kempe Gowda was a many-sided personality. He was an enlightened, brave ruler as well as a great town planner. In short, the Bull Temple reminds us of the story of the founder of Bangalore city Kempe Gowda. People believe that when Kempe Gowda constructed the temple, the bull inside it was growing and growing. The people thought that the temple would be too small for the ever-growing bull in stone. Some iron rods were fixed around the Bull to arrest its growth.